Owners of Highlands NC homes, the time has come to prepare your landscaping for the winter. This is an essential part of home ownership. While many homeowners may have a landscaping company maintain their Highlands NC properties others do it on their own. Regardless it is essential to make sure the basics are getting done. Taking care of your yard and gardens now can mean an easier spring season for your grass and plantings. What needs to be done to prepare your Highlands NC property for winter? One important thing to do is to disconnect all hoses from outdoor faucets. The next step would be to drain the hoses and put them away inside for the winter. Water in hoses can freeze and crack the hoses. Furthermore, leaving a hose attached to an outdoor faucet can lead to interior damage if the pipes freeze as a result. Another important task is to rake the leaves and debris from your lawn. This enables you to seed, aerate, and fertilize the lawn. This work will make it possible for your yard to come back to life in the spring. Everyone loves a healthy lawn and prepping it for colder months is helpful toward achieving this goal! Contact our team at Berkshire Hathaway HomeServices Meadows Mountain Realty today to learn more about Highlands NC real estate. We welcome the opportunity to update you on the market as well as everything involved with buying and selling a home. Additionally we can recommend reputable local landscape contractors than can help you prepare your property for winter. 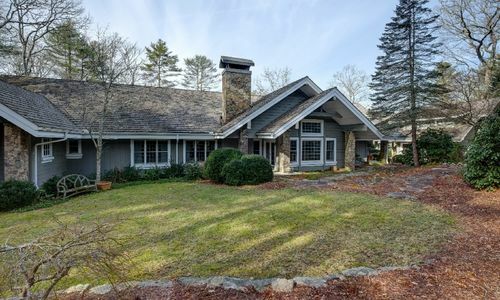 Let our knowledge and experience serve as your guide to Highlands NC homes. Click here to read “Fall Yard Care Checklist: What to Do When” from REALTOR Magazine.